That day we THOUGHT things were getting started. It seemed the spotting was a cruel fluke, though, as the following days brought zero action except for increasingly sleepless nights and an uncomfortably large belly. The nights I couldn’t sleep, I’d lean over to let Steve know I wasn’t in labor, then head downstairs, pugs in tow, for a snack and another animated children’s movie. My due date of March 11 finally arrived. A couple days later, we went in to see the midwives for my first post-due date non-stress test (NST), where my belly gets hooked up to a couple monitors that make sure baby’s heart rate isn’t too high or low. I passed with flying colors, but we also had to have an important conversation with the midwife that day. 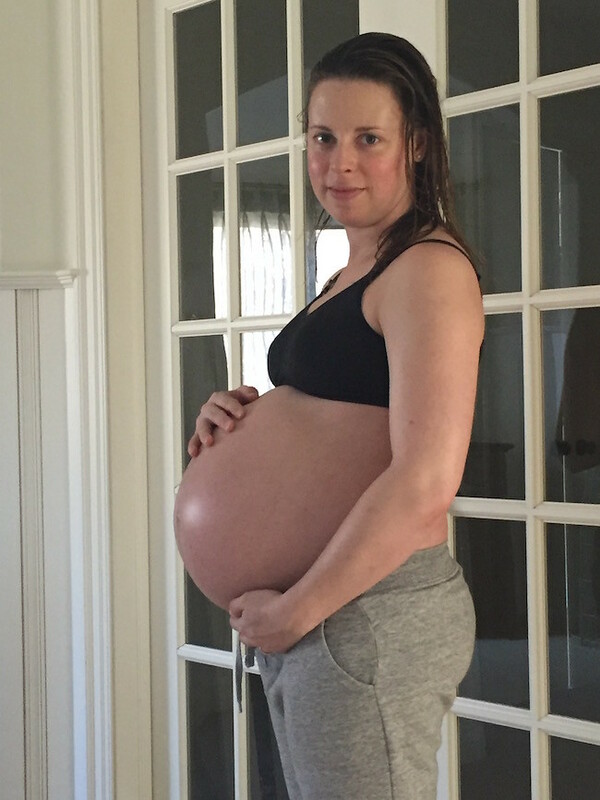 Over the weekend, as I hit 40 weeks, I started to get really stressed about my due date. I remembered early pregnancy, how I told everyone I expected it would be later than March 11. I verified with several tools online that my March 11 due date reflected a standard menstrual cycle and my last period—it didn’t seem we had adjusted at all for the early ultrasound results (the most accurate dating method) or my 33 day cycle. I showed Steve the calculations so he could help me explain our doubt to the midwife without me having another emotional breakdown. In what I imagine is a pretty rare scenario, reviewing the early ultrasound results bought us a very surprised midwife and eight extra days. Yep, at over 40 weeks pregnant we officially changed my due date from March 11 to March 19. It was a decision we didn’t know would be so crucial, because if we hadn’t pushed for that extended due date, baby Evan would have arrived at least three days prior to his actual birthday, possibly accompanied by a myriad of difficulties due to a premature birth (premature in that he would have been forced out before the perfect time). The next two weeks, I was a little more relaxed, but we still spent a lot of time trying the usual tricks to get labor going. My new due date came and went with a little stress, but I focused on the full two weeks we still had to go into labor for a birth center birth. We saw the midwives for our first legitimate NST on March 20, and Evan passed again. I think we talked about the possibility of induction down the road and confirmed that we would decline induction at 41 weeks unless the baby was in distress. As the next weekend arrived, I was feeling optimistic that labor had to start soon, and on Saturday, I suggested that instead of walking the mall, Steve and I head to Greenwich Avenue to get some serious hill climbing, fresh air, and, most importantly, crepes. We started with a late lunch at Meli Melo for soup and crepes. Our soup arrived first, and as we began slurping, I sat straight up, did what Steve described as a pug head tilt, and told him with a pretty big smile that I felt a weird pop and was pretty sure my water broke. Um, yep, I was definitely feeling a slow leak, let’s finish our soup and get the crepes to go…okay, on second thought that is not a slow leak. It’s more like gushing. We’ll take the check, all the food to go, and Steve all but bolted out the door, trying to remain as calm as possible while he got the truck and I sat in a pair of leggings now soaked in super hot amniotic fluid. I can’t think of anything more appetizing. Thankfully, the restaurant’s chair was NOT upholstered, and I was trying to discreetly shove napkins underneath me without the table eight inches away noticing the blatant health hazard occurring. I finally had to straight up tell one of the waiters that my water broke in order to get him to bring a plastic bag for all the napkins I used, and meanwhile I was trying to calculate a tip and sign the check AND text and call everyone in my immediate family. An older French woman, the restaurant’s owner, who greeted my pregnant self excitedly when we arrived for lunch was now wishing us well and sending us off with trash bags for the seat of the truck—genius. So, almost three weeks after we thought things could start any minute, it finally appeared things were starting! Although I was uncomfortably marinating myself, my sneakers, and the truck upholstery in amniotic fluid all the way home, Steve later described me as giddy as I talked to my family and called the midwives. I basically stripped down in our mudroom so the pugs wouldn’t discover the soaked clothes. The next half hour or so at home is a bit of a blur. When I went to the bathroom, I noticed the water was tinged with meconium (Evan’s first poops)—I little more than I would like to have seen (it also included most of what appeared to be my mucous plug). Little Evan had been practicing his poops in utero! Steve took the dogs out while I downed my soup without tasting much of it, then we packed up the birth bags and headed to the birth center for another NST. I can’t remember exactly, but I think the NST was necessary because meconium was present. I was negative for Group B Strep, so thankfully we didn’t also have to start antibiotics when my water broke. Based mostly on what I’d seen on TV and in movies, I had the idea that labor was imminent after my water broke, but that’s where I was in for more changes to our plan. The midwives assessed the meconium as light to medium, which still didn’t put us at high enough risk for respiration issues for the baby to be out of the running for the birth center, and baby was still doing great per the NST results. The midwife on duty (Monika?) and the student midwife, Arielle, informed us that most women go into labor within 48 hours of their water breaking (I think it was 80 or 85%), so, even though I was in the minority to experience my water breaking before labor started (about 10% of women), I assumed that our highly normal pregnancy would resume with me heading back into the majority with labor starting soon after we returned home. Wrong again. For the next 48 hours, we went about our normal business at home as much as we could. We got rest and ate well knowing we could have a long labor ahead of us, but I also tried to move as much as possible to get this baby moving. 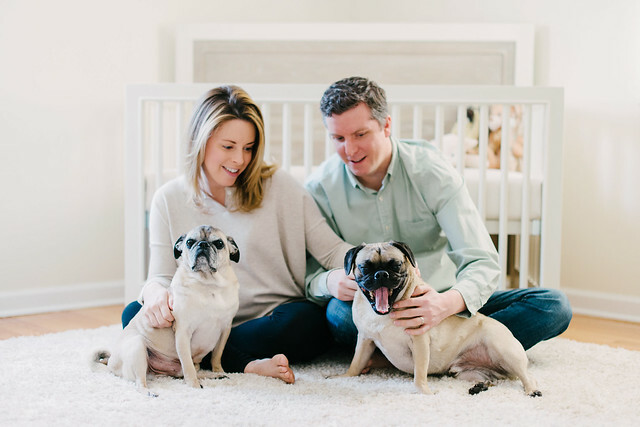 I still hadn’t experienced a real contraction, and the pugs followed nervously as I walked the entire house, up and down and up and down the stairs countless times. We drove to the birth center again at the 24 hour mark for another NST. This time, I think baby was a little sleepy, but we eventually roused him with a juice box (preschool foreshadowing) and, again, everything looked great. The conversation with the midwives got a little more serious as they explained the risk of infection the longer we waited for spontaneous labor or induction after my water broke, but Steve and I really held out hope for labor to begin spontaneously and expected that things would get going well within the next 24 hours. We headed home again. As I got more anxious, I called back the accupressure masseuse who I was supposed to see on Sunday morning, hoping to see her ASAP. I had cancelled our original appointment after my water broke, thinking I wouldn’t need her labor-inducing super powers (wrong…again). She graciously made time for a last minute reschedule, and on Sunday evening, after already logging several hours in the car driving back and forth to the birth center that weekend, we made another long trip to Nicole’s studio for a massage that I was certain would induce labor. The massage was amazing. It helped me to relax deeply and focus on the baby, and as Nicole worked on pressure points for contractions, she led me in clearly visualizing baby Evan’s arrival time. I pictured the clock at the moment I wanted my first real contraction to come—just before midnight that night. On the car ride home we didn’t talk much as I tried to really stay in the zone and maintain that connection with the baby. Steve worked on the same pressure points for me at home that night, along with foot massage. He was clearly willing to do anything to help get this baby out! I placed a lot of faith in visualizing that first contraction, but we woke on Monday morning without any sign of real labor. I knew that God already had a plan for Evan’s birth, so I continued to pray, too, placing faith in an even better time when the perfect team and the perfect circumstances would align for Evan’s birth. I alternated between praying, visualizing a new first contraction time around lunch, and walking all over the place to try to move the baby. The time came to call the midwives again, though, and report the lack of action. This time—around mid-afternoon on Monday—we knew that we were leaving the house for the last time without our baby. And so began the tears. I think my first really significant cry was somewhere between the garage and the driveway, as I was overcome with both happiness for our soon-to-be family of five and uncertainty about how and when this baby would arrive. We still weren’t ready to commit to induction. Our plan was to head to the birth center for our third NST, then, if the baby wasn’t at risk, to go to a nearby hotel to wait a little longer. I had a bottle of castor oil in my bag, although I couldn’t bring myself to take it yet, and our doula, who we’d been in touch with since Saturday, would meet us at the hotel with her own figurative bag of tricks. Although baby did pass this final NST, Steve and I, alone in the exam room at the birth center, were starting to feel the pressure to induce, to avoid possible infection, the risk of which increases the longer you wait for labor to start after the water breaks. And with that risk comes others, such as the risk of caesarean delivery. Emotionally, we decided to go to the nearby mall to try one last-ditch effort at walking this baby out while we tried to get a grasp on this very rapid change in plans. We walked laps, with me stopping to pee or cry every five minutes or so, and although I said we wouldn’t talk about the birth or our options while walking, that was all we could talk about. I saw Janie and Jack at a distance and was indecisive about going in. The prospects for birthing at the birth center were dwindling every minute, and it was a fresh loss. I wasn’t sure I wanted to be surrounded by cute baby clothes. But, amidst tears (of course), I either decided or was convinced by Steve to go in, and it was refreshing to be reminded that, at the end of Evan’s birth story, we were going to have a brand new baby, ready for cute baby clothes, who would make me forget all about the perfect birth I pictured. We picked out our first gender specific items, and it’s the sweetest feeling remembering that anticipation, that surprise we would get oh so soon. We left with one pink and one navy blue baby hat, both impossibly tiny (so much so that they almost didn’t fit!). Only a half hour or so into walking, I knew that exercise was not going to get Evan to start moving. Maybe it was mental exhaustion, or maybe it was a mother’s intuition, but I told Steve enough was enough—I knew this baby was going to need some assistance coming out. The day my water broke, when we were at the birth center for our NST, I was taken aback when midwife Monika said that the goal was a vaginal birth. Wasn’t the goal a beautiful, intervention-free, natural birth at the birth center? Now, though, I was beginning to understand all the factors at play, and I knew that the chance of interventions would grow larger the longer we waited for Evan to arrive spontaneously before the 72 hour mark. We stopped at one of the little couch areas in the mall, and with more tears from both of us, Steve called the midwives and doula to let everyone know we would head to the hospital for induction after getting some dinner. 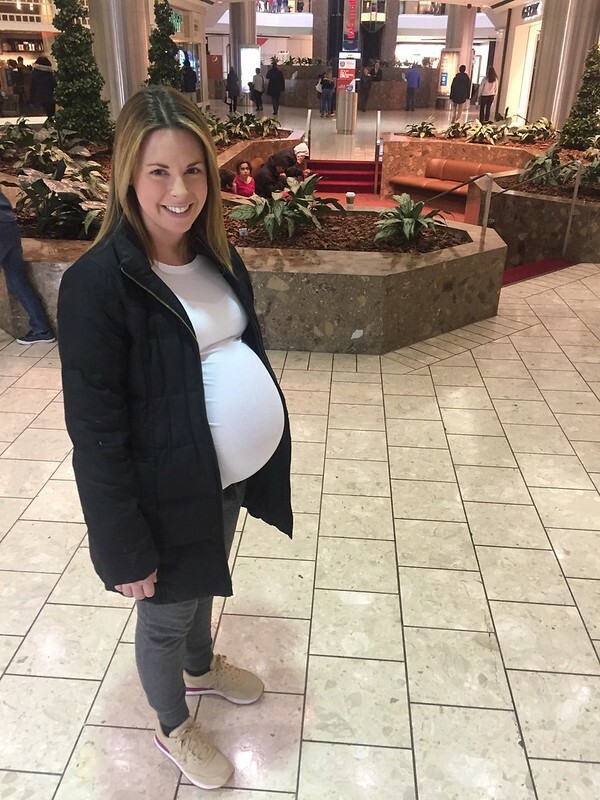 As an aside, it will be impossible for me to ever view a mall the same way again after pregnancy. I bet that if one stops to pay attention, it’s amazing the number of conversations like this, as well as early labors, that take place in shopping malls! The decision for our true last good meal before inducing labor was Cheesecake Factory. I craved buffalo blasts and peanut buttery cheesecakes throughout pregnancy, so what better choice? As it turns out, even a favorite restaurant couldn’t rev our appetites. We ordered our favorite buffalo blast appetizer, Steve got a steak dinner, and I ordered a huge enchilada plate, but when all was said and done, the bread and butter was the most popular item on the table. We talked more about how hard this process had become but also how we knew it was the best decision, then we packed up our leftovers, knowing our appetites should be in full swing after this baby arrived, no matter the time of day. In the car, we made a few last phone calls. Steve’s parents had arrived at our house, so we knew the pugs were in the best of hands. We struggled to keep it together as we FaceTimed my parents and asked them to pray for us. Steve and I wiped away our tears as best we could, hugged and assured each other yet again that this was the new best plan, and pulled away for the short drive to Danbury Hospital. Maternity photos by Emily at North Photography Collective.